Schwartz & Wade, 9780375836046, 128pp. Here is the first book in the highly acclaimed Toys trilogy, which includes the companion books Toy Dance Party and Toys Come Home and chronicles the unforgettable adventures of three brave and loving toys. In these six linked stories from Emily Jenkins, and illustrated by Caldecott Medal winner Paul O. Zelinsky, readers will meet three extraordinary friends. Lumphy is a stuffed buffalo. StingRay is a stuffed stingray. And Plastic... well, Plastic isn't quite sure what she is. They all belong to the Little Girl who lives on the high bed with the fluffy pillows. A very nice person to belong to. Together is best for these three best friends. Together they look things up in the dictionary, explore the basement, and argue about the meaning of life. And together they face dogs, school, television commercials, the vastness of the sea, and the terrifying bigness of the washing machine. 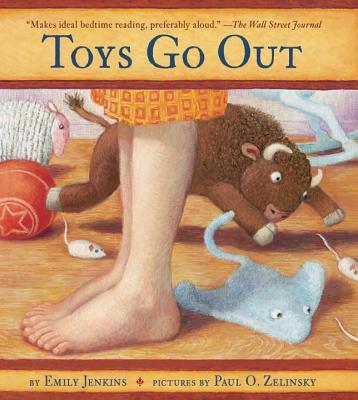 A Parents' Choice Silver Honor Winner, an ALA-ALSC Notable Children's Book, and an Oppenheim Toy Portfolio Platinum Book Award Winner, Toys Go Out is truly a modern classic. Emily Jenkins has written many highly acclaimed books for children, including the popular award-winning chapter books Toys Go Out, Toy Dance Party, and Toys Come Home, as well as a picture book that features the same beloved characters, Toys Meet Snow, which was named a New York Times Notable Book and a Wall Street Journal Best Children’s Book of the Year. She is also the author of A Fine Dessert, a New York Times Best Illustrated Book of the Year; Water in the Park, a Booklist Editors’ Choice and a Bulletin Blue Ribbon Book; and Lemonade in Winter, a Publishers Weekly Best Book of the Year. Visit her at emilyjenkins.com. Paul O. Zelinsky is the illustrator of Dust Devil, a New York Times Notable Book and an Oppenheim Toy Portfolio Platinum Award winner. He received the Caldecott Medal for his retelling of the classic fairy tale Rapunzel, as well as three Caldecott Honors, for Hansel and Gretel, Rumpelstiltskin, and Swamp Angel. His illustrations for Toy Dance Party were called “superlative” in a starred review by Kirkus Reviews. He lives in Brooklyn, New York. Learn more at paulozelinsky.com.